Формування бітумо-гідротермальних мінеральних асоціацій, під якими автори розуміють просторово і генетично обумовлене спільне знаходження у гірських породах гідротермальних мінералів та природних бітумів, характеризуються специфічним флюїдним режимом. У породах Західно-Донецького грабену гідротермаліти, що представлені рудними та нерудними мінералами, асоціюють з твердими бітумами – природними сполуками, що складаються з високомолекулярних вуглеводнів та гетероатомних молекул різного виду і походження. Це явище спостерігається у породах антиклінальних структур з якими пов’язані відомі рудні поля ртутної та поліметалічної спеціалізації – Микитівське, Дружківсько-Костянтинівське та Слов’янське. Для цих поліхронних гідротермальних систем вирішальне значення у виникненні бітумо-гідротермальних асоціацій мала ларамійська фаза альпійського тектогенезу. Структурно ці системи приурочені до тектоногенних зон розущільнення у склепінних частинах антикліналей. Ореольні води, що тут формуються, уміщують як хімічні елементи та сполуки, запозичені з порід, мінералів та бітумів, так і ті, що надходять з підкорових глибин у флюїдних потоках. Геохімічні аномалії (літо-, гідро- та газо-) супроводжуються геотермічними і утворюються на ділянках сучасної тектонічної активізації антиклінальних структур, що свідчить про сучасний (постгідротермальний) етап розвитку гідротермальних систем у регіоні. Arsanova, G. I. (1974). Rare alkali in the thermal waters of volcanic areas. Nauka, 111. Bagrij, I. D. (2016). Water-based hydro-geosynergetic biogenic-mantle hypothesis of hydrocarbon formation and its role in substantiation of search technology. Geologicheskij zhurnal, 2, 107–132. Bezruk, K. O., Lisichenko, G. V., Suyarko, V. G. (2013). Geochemistry of mercury in underground waters of geological structures of Donetsk folded structure. Kyiv: IGNS of the National Academy of Sciences of Ukraine and KhNU named after VN Karazin,132. Belokon', V. G. (1984). Bassejn r. Seversky Donets as a geodynamic system that reflects the processes of great depths. Geologicheskij zhurnal, 1, 1–13. Beskrovnyj, N. S. (1986). Petroleum formation: unity of oil and ore formation. Zhurnal Vsesojuznogo himicheskogo obshhestva imeni D. I. Mendeleeva, 5, 569–574. Bondarenko, G. N. (1983) Formation of the isotope composition of the carbonate system of natural waters. Nauk.dumka, 152. Vetshtejn, V.E., Gavrish, V. K., Gucalo, L. K. (1979). Isotope composition of hydrogen and oxygen of waters in deep fault zones. Sov. Geologija, 7, 96-103. Voznyak, D. K.( 2007) Microinclusion and recon struction of the endogenous mineralization conditions. Naukova dumka,279. Gavriljuk, O. V. (2015). Paleohydrogeochemical features of bromine accumulation in the south-eastern part of the Dnipro-Donets valley. Serіja: «Geografіchnі ta geologіchnі nauki», 20 (3), 145-153. Gavrish, V. K., Dobryansky, L. A., Kuril, M. V. (1984) Mercury-hydrocarbon zoning of the Don-Dniprovsky trough DAN USSR, 7, 18-21. Zaciha, B. V., Petrichenko, O. I., Dolishnij, B. V., Las'kov, V. A. (1973). Origin of mineral formation of the Slavic mercury deposit. Mineralogicheskij sbornik L'vovskogo universiteta, 27, 326–332. Dobryansky, L. A., Gavrish, V. K. (1988). Paragenesis of mercury and hydrocarbons - an important direction of geological research. Geological Journal, 48, 3-11. Ishhenko, L. V. (2015). Geochemical criteria for the search of hydrocarbons in the east of the Dnipro-Donets depression. Visny`k XNU imeni V.N.Karazina, 48, 88–93. Ishhenko L. V. (2016). 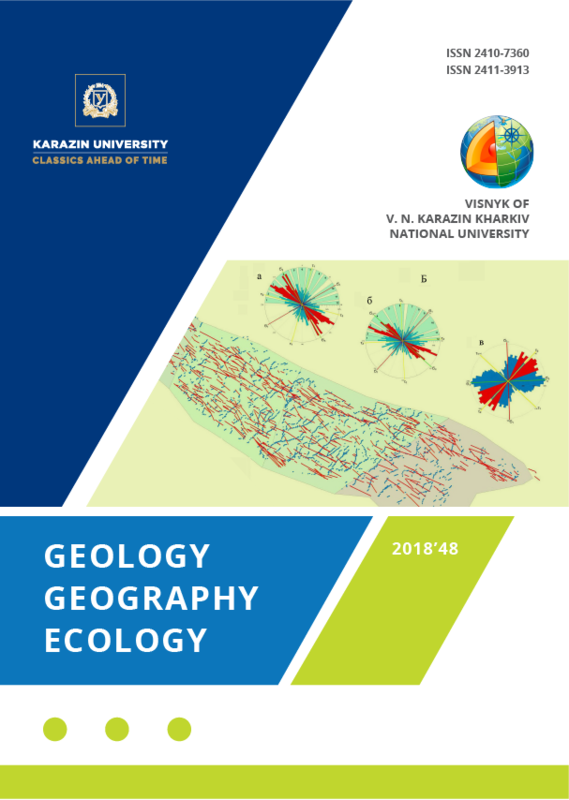 Patterns of placement of hydrocarbon deposits and zones of hydrothermal mineralization in the territory of the eastern part of the Donetsk folded structure.Visny`k XNU imeni V. N. Karazina, 45, 38–42. Ishhenko, L. V. (2017). Conditions for the formation of bitumen-hydrothermal associations in the anti-clannic structures of the West-Donetsk graben. Mizhnarodna naukova konferenciya «Geologiya i geoximiya goryuchy`x kopaly`n», pry`svyachenoyi 100-richchyu vid dnya narodzhennya akademika G. N. Dolenka, 69–71. Kirikilica, S. I., Levenshtejn, M. L., Fridman, A. I. (1972). On the composition and nature of free gas emissions (gas jets) of mercury ore occurrences in the Druzhkov-Kostantinovskaya anticline. Geologicheskij zhurnal, 2, 92–97. Kononov, V. I. (1983). Geochemistry of thermal waters of modern volcanism (rift zones and island arcs). Nauka, 216. Ljal'ko, V. I. (1985). Heat and mass transfer in the lithosphere. Naukova dumka,259. Lukin A. E. (2004). On the formation of fluid-conducting fluid systems in oil and gas basins. Geologicheskij zhurnal, 3, 34–45. Lukin, A. E., Pikovskii, Yu. I. (2004). On the role of deep and super deep fluids in the processes of oil and gas formation. Geological Journal,2, 21-33. Maslennikov, V.V. (1987). The similarity of the conditions for the formation of oil gas and mercury deposits,10, 108-114. Nant, D. E., Anderson, E. T., Grubbs, D. E. (1965). On the probable ore-forming magmatic solution and metamorphosed rocks discovered by a deep well in Southern California. Geohimija sovremennyh postvulkanicheskih processov. Moscow, Russia: Mir,167-171. Panov, B. S., Korchemagin, V. A., Pilot, I. K. (1974). Isotope composition of oxygen and carbon of Donbas carbonates. DAN USSR, 3, 226–234. Stebelskaya, G. Ya. A (2017). New View on the Problem of the Classification of Oil. The Bulletin of the VN Karazin KhNU, 46, 50-56. Stebelskaya, G. Ya. (2017). Regularities of placement of natural bitumen deposits. Geology and Geochemistry of Combustible Minerals, 1, 168-169. Suyarko, V. G. (2006). Geochemistry of groundwater. Kharkov, KhNU named after VN Karazin,296. Suyarko, V. G. (1981). Hydrogeochemical features and search criteria for mercury deposits in Donbas. Geological Journal, 2, 147-149. Suyarko, V.G., Zagnitko, V. M., Lisychenko, G. V. (2010). Structural-geochemical criteria of forecasting of hydrocarbon accumulations (on the example of West-Donetsk graben). Kiev: Salyutis,83. Suyarko, V.G., Gavryliuk, O. V. (2014). On sources and bromine migration in underground waters (on the example of Dnieper-Donetsk aulacogen). The Bulletin of the Kharkiv National University named after VN Karazin Series: "Geology. Geography. Ecology", 41 (1128), 70-75. Suyarko, V. G., Ishchenko, L.V., Serdyukova, O.O. (2017). Geochemical features of the hay water of the main types of hydrothermal mineralization of the Donetsk folded structure. Search and ecological geochemistry, 1, 44-51. Zubkov, V. S., Stepanov, A. N., Karpov, I. K., Bychinsky, V. A. (1998). Thermodynamic model of the СН system under conditions of high temperatures and pressures. Geochemistry, 1, 95-101. White, E. D. (1970). Deposits of mercury and non-ferrous metals associated with thermal mineral springs. Geochemistry of Ore Deposits. Moscow: The World, 479-524. Chekalyuk, E. B. (1971). Thermodynamic foundations of mineral origin of oil. Kiev: Naukova Dumka,265. Khokha, Yu. V. 2014Thermodynamics of deep hydrocarbons in forecasting of regional gas content. Kyyv: Naukova dumka, 56. Shumlyansky, V. A. (1983). Cimmerian metallogenic epoch on the territory of Ukraine. Kyyv, 234. James, A. N. (1980). Tow metallogenesic maps for North America. Geol. Rundshall, 69, 594–608. Giardini, A. A., Melton, C. E. (1982). Evidence that stable carbon isotops are not a reliable criterion for distinguishing biogenetic from non-biogenic petroleum. Petrol. Geol., 4, 437–439. Ellis, A. I., Mahon, W. A. (1964). Natural hydrothermal sestems and experimental hot water. Geohim. et Cosmochim. Acta, 8, 1323-1357. Mollex, G., Furi, E., Burnard, P. (2018). Tracing helium isotope compositions from mantle source to fumaroles at Oldoinyo Lengai volcano, Tanzania. Chemical Geology, 480, 66–74. White, D. E. (1957). Magmatic, connate and metarmorphic water. Bull. Geol.Soc.Amer, 12, 1659-1682.